TROY, Ala. – While the rest of the nation was focused in national attention of college football’s top recruiting classes, the Troy football program was making a name of its own on Wednesday inside the offices of Tine Davis Fieldhouse. Twenty-one student-athletes faxed in their letters of intent throughout the day Wednesday, and they join three mid-year additions to the program to make up the 2013 class. The class includes two four-star players, according to Scout and ESPN. Sam Lebbie, rated as the No. 6 middle linebacker in the nation by Scout, highlights the class ahead of Keion Payne, the nation’s No. 19 cornerback coming out of high school. The group is also highlighted by the nation’s No. 3 fullback (ESPN) in Joshua Anderson. Anderson, a native of Douglasville, Ga., was named first team all-region as a senior, and was rated a three-star recruit by both ESPN and Scout. He finished his senior season with 623 yards on the ground and 12 touchdowns, to go along with 48 tackles, one interception and one forced fumble defensively. Lebbie underwent heavy recruitment along the way, but lands at Troy as the sixth best player in the state of Maryland. He was rated a four-star recruit out of DeMatha Catholic High School in Maryland, and took the prep school route his first year after graduation. Lebbie finished 2011 with 79 tackles, 15 for loss, eight sacks and seven forced fumbles. He was also named to the 2011 Washington Post All-Metro first team defense and named a member of the 2011 Maryland Consensus all-state defense. Taylor Driggers, a local player from Brantley, Ala., also sent in his letter of intent this morning and will bring with him loads of defensive experience. The six-foot-two, 250 pound defensive tackle helped Brantley to Alabama 1A State Championships in his freshman and senior seasons, and led the Bulldogs to a perfect 15-0 record in 2012. He knows a little something about defense, as he helped Brantley allow only 47 points all season, and posted 11 shutouts in 15 of their contests. Eight different states are represented in Troy’s 21 players to sign, including 12 from the state of Alabama, four from Georgia and three from Florida. Of the 24 total players, between Wednesday’s signees and the mid-year additions, 11 will play offense and 13 will suit up on defense. Two running backs, three wide receivers and five offensive linemen are the additions to the offense, while the defense welcomes five defensive lineman, two linebackers, six defensive backs and one athlete. 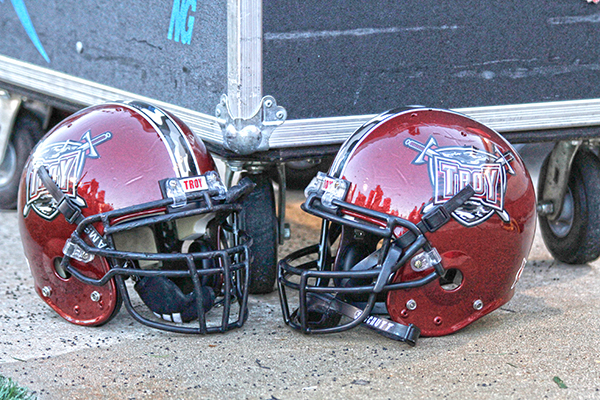 For a complete list of Troy’s signees, visit www.TroyTrojans.com.